This release comes just in time for many teams migrating from HipChat to Slack based on the end of life of HipChat on February 15, 2019. With Jira Integration+ teams migrating from HipChat will find the features they are used to having in HipChat available on their Slack team along with an extensive list of new features to utilize. Discuss Jira issues in Slack and join or create Slack channels from the Jira issue details screen. 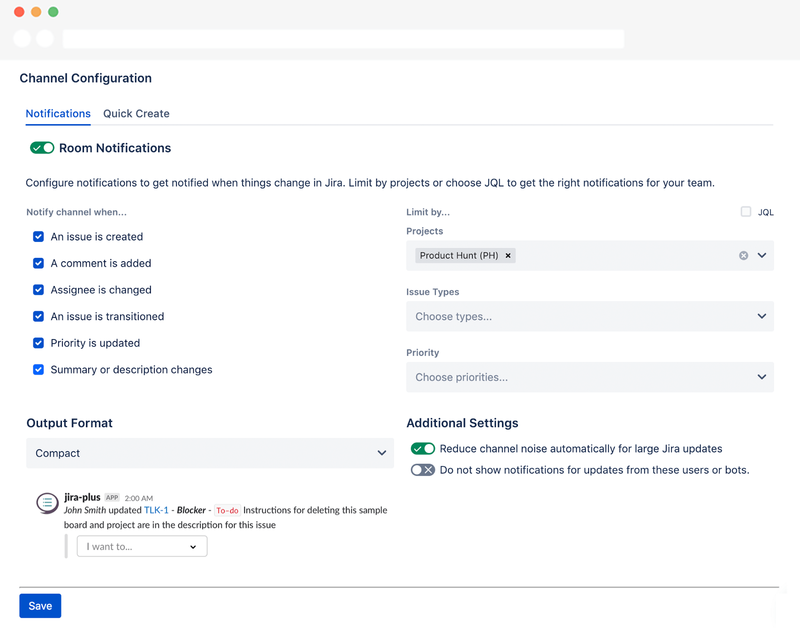 Configure when you want to be notified in Slack when things change in Jira. Use the GUI to make the setup easy or switch to JQL mode to get advanced. This feature creates a web hook in Jira for you so administrators are no longer required to manage hooks for the team. Tested with 1,000s of hooks as part of the Data Center approval process. Mention issues in Slack and get info from Jira. With Jira Integration+ you can take action right from the response. 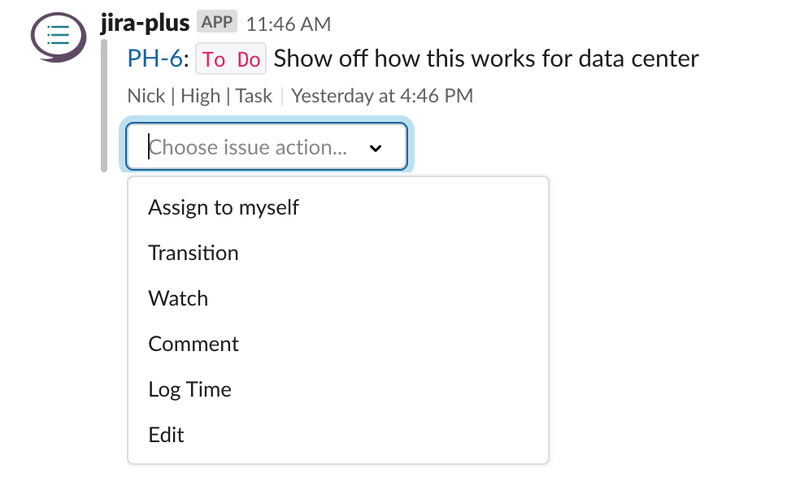 Use Jira Integration+ to create issues right from Slack. Take action by assigning, commenting, watching, editing or logging work. Search for what you need from Jira. Built in commands for projects, sprints and JQL support to find anything you need. Combine with scheduled messages to search for what you need and repeat at a schedule you choose. Important: Jira Integration+ fully supports Jira permissions and users can only see projects based on Jira permissions. This is a full stop override. Jira Integration+ uses an application link to connect to Jira’s REST APIs. Your administrator creates the connection one time and everyone can use the bot. When users take action on issues the bot gets user based OAuth data to create accurate attribution in Jira. The result is identical to actions performed directly in Jira. The use of the Jira APIs with user authentication means your permissions in Jira are respected by the bot. Users can’t look at projects they can’t access in Jira and can’t take actions they are not allowed to take. Keep in mind how Slack works and understand some specific use cases on our help docs. We pride ourselves on providing over-the-top support for our customers. Visit our help docs, chat us up on intercom or email us and we respond and care. No long waiting list of forum to not get what you need here. We keep a backlog public and love to hear your ideas for improvements. The release of Data Center support was one of them. Check out the backlog to see what we are working on next. Add our Jira add-on to your Data Center instance to start your free 30-day trial. Once added the system will guide you through the process of setting up your Jira Integration+ bot in Slack. Thanks for your time! Looking forward to your feedback!